Also Recommended: Spice and Wolf, Allison & Lillia. Notes: Based on the manga by Akira Ishida and Mamare Touno, serialized in Comp Ace. Arriving at the Demon King's castle with the intent to kill, Hero (no, really, that's his name) is more than a bit surprised to find that said Demon King is a staggeringly beautiful redhead who has different plans for the both of them. Quite the looker, isn't she? I imagine she'd be the last anyone would expect meeting up with on their way to fight the ultimate "evil". I airquote "evil", because the show proceeds to spend the first episode having Mao -- yes, that's her name too. It's a title thing, I suppose -- basically do a sales pitch for the hero, and for strangely noble reasons for a supposed demon King, and it's actually kind of amusing how nearly constantly the Hero is taken aback by all of this. The reason for her wanting to meet the Hero turns out to be... a desire to end the war. This is where the show turns strangely intelligent. While most of the beginning of the argument comes across as rather propagantastic from the hero's side, he then points out quite a few problems with her plan, and not only does she support those thoughts, she adds a few pointers of her own, and embellishes some more about the other problems they'll face. It's a surprisingly pragmatic, yet still optimistic outlook on the future of both worlds. And it's that endearing optimism (tempered with a realistic outlook on how and why, if they want to make the world a better place, it won't be done in a day -- or without more blood spilt) that makes what basically turns into a dramatical documentary an entertaining watch. This is the point where it becomes quite clear why they not only had the same director and scriptwriter as in Spice and Wolf, but also had the same voice actors for the two lead roles. Make no mistake about it; the chemistry between Hero and Mao is vastly different to the one between Holo and Lawrence from Spice and Wolf. That's partially because Spice and Wolf established the HELL out of their relationship even in the first season in a way that almost literally made it shoot sparks, and got downright mean about it when it was threatened quite permanently in the second. None of this really happens in Maoyu, where the relationship between Mao and Hero (aka Yuusha) proceeds significantly slower. Mostly because both of them are kept quite busy; Mao with her plan progression of bringing education, farming cultivation techniques, new food items, science... I could go on... and Hero with running around and keeping any potential skirmishes to the bare minimum as far as property damage and fatalities go. The relationship they have is still kind of innocent and sweet, more along the lines of Belldandy and Keiichi from Ah! My Goddess. It's kind of cute because despite her vast scientific and educational wisdom, Mao is... pretty naive, although the anime made the poor choice of embellishing her thoughs of "I know you humans probably have different opinions of what you consider attractive in a woman than what I have" with some additions of "waah waah I'm fat" lines. (The latter of which never happened in the manga.) Thankfully, this seems to be a one-time case, and the show returns to her being her intelligent, go-getting self with goals it's easy to cheer for. But before anyone starts thinking this sounds kind of easy; much like in Spice and Wolf, our main characters can and will go up against the people in power in this world, and they are naturally not keen on sharing the benefits of the higher class. The inner circle of the Church makes a popular return as main antagonists, but of course the leaders and higher-ups of the regions themselves also take offense to this upstart literally dropping out of nowhere (the demon kingdom) and messing around under the hood of their main ride (hogging wealth and power to remain among the upper class), putting their jetset life at risk. Behind this is an underlying thought that, the more people are well off in their current lives, the less interesting they are at upsetting the status quo, which brings the risk of things not working out. It's a selfish thought to be sure, and one many of us are guilty of even outside this show. Though Maoyu has the decency to point out that selfishness can and will swing both ways; even among those who have lived the life of thralldom, you are not in any more "right" to take advantage of the kindness of the wealthy because you are poor than you are taking advantage of the poor when you are wealthy. The main topic seems to be that you should be given the chance to work to improve your own situation, and through that, create opportunities for others to work with you. But more than that, to supply for yourself enough to eat, a roof over your head and the ability to stand on your own two legs. And maybe more than that, it completely eschews the rationale that a world's problem will be solved by defeating a symbolic evil through violence. I was a little concerned when I looked at the promo art for this show, because all the characters in it were given a softer, rounder look compared to the manga's more... edged, shounen-ish flavor. Thankfully, getting used to the characters was no big problem, and the animation is more than satisfactory enough to serve the show's purpose. Where the show falters is in the background art, all of which have been run through a filter of sorts. It creates a bit of a disconnect between character art and backgrounds, even though the world itself seems really well built and imaginative. It rarely gets truly messy, but I imagine not everyone will gravitate towards this show's way of settling this. And, like most anime based on currently unfinished work, don't expect a proper ending. I'm throwing that out right now, because despite me not minding the ending at all -- it's very open, and introduces a slew of other angles for the benefit of any future seasons -- but I already know a few who didn't like it, and I can only assume there's more of you out there who are going to feel the same, though said misgivings were partially grounded in the fear that this season would be the end of it. I can understand that too; I'm very afraid that the two seasons we got of Spice and Wolf will be all we'll ever get. 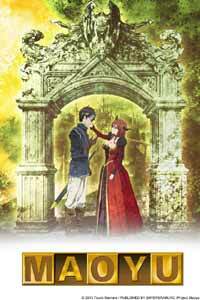 On the other hand, the really nice part of all of Maoyu is that there is basically no filler in it. In fact, it's almost mercilessly brief at times, glossing over some of the side characters who, in the manga, lead important plot points taking place later in this series. It's also surprisingly up-to-date, which means we might not see another season for quite some time. If at all. ...and we'd get something I'd return to any day of the week. Recommended Audience: The main theme of the series deals with some pretty grisly results of the clashes of war, including the lesser noble actions taken by the winning side. This is mostly made for the mature side of the audience, but can still be watched by teenagers. On the fanservice side, there isn't much to speak about, but you do get to see Mao in some impressive threads, plus in the first episode, her chest is used quite vigorously and animatedly as a selling point in her favor in the big Hero vs. Demon King debate. These are mostly aimed towards teenagers, but can still be watched by adults without having to feel too guilty about it. 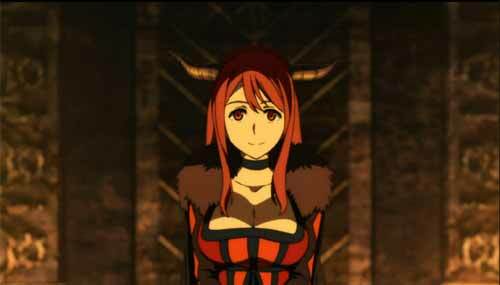 Maoyu © 2013 ARMS, Pony Canyon, Project Maoyu.